The Oklahoma State Legislature authorized the formation of the Oklahoma Municipal Power Authority in June 1981 with the passage of the Oklahoma Municipal Power Authority Act. By December 1984, 26 cities had signed power sales contracts. Then on July 1, 1985, OMPA came into existence as a full fledged power supplier. After the success of the first year, 6 more cities joined and in 1989 Fairview joined. In 1993, Perry became OMPA’s 34th member when the council signed a power sales contract. Manitou became the 35th member in 1995, Purcell became the 36th in 2008 and Geary became the 37th in 2010. The Town of Orlando and the City of Watonga became OMPA’s 38th and 39th member city in 2011. In September of 2015, the Town of Mooreland and the Town of Fort Supply became OMPA’s 40th and 41st member city. Beginning in June of 2016, OMPA will begin serving our 42nd member city, the City of Cordell. OMPA’s power supply comes from a variety of resources; wind, hydro, natural gas, coal and others. 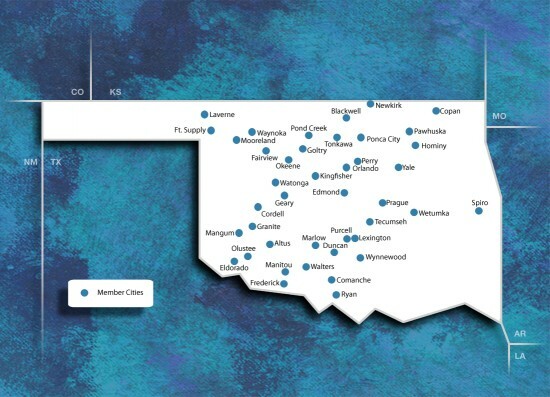 Fairview, Kingfisher, Laverne, Mangum, Pawhuska and Ponca City own small generating facilities, and when necessary OMPA schedules and purchases the generated power.